"Salmon is a favorite of my husband. This recipe never fails to be a hit, whether we broil the salmon in the oven or grill it outdoors. Pair it with some homemade teriyaki fried rice to complete your meal." Mix sesame oil, lemon juice, soy sauce, brown sugar, sesame seeds, ground mustard, ginger, and garlic powder in a small saucepan over low heat. Bring to a simmer, stirring until sugar has dissolved. Set aside 1/2 cup of marinade for basting. Pour remaining marinade into a resealable plastic bag and place salmon into the marinade. Squeeze air out of the bag, seal, and marinate the salmon steaks for at least 1 hour (2 hours for better flavor). Drain and discard used marinade. Set oven rack about 4 inches from the heat source and preheat the oven's broiler. Place salmon steaks into a broiler pan and broil for 5 minutes. Brush steaks with reserved marinade, turn, and broil until fish is opaque and flakes easily, about 5 more minutes. Brush again with marinade. 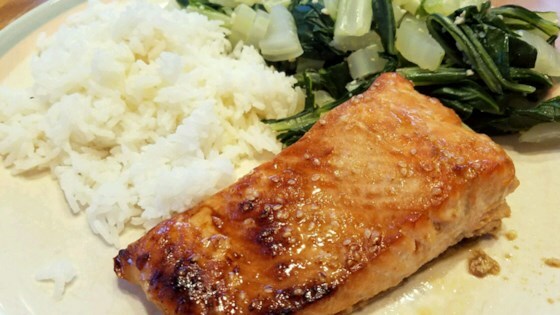 An easy and delicious broiled salmon with homemade teriyaki sauce. This was fine, but not great. I loved this recipe and plan to make it again. I doubled the recipe and made a fillet instead of a steak. YUMMY!